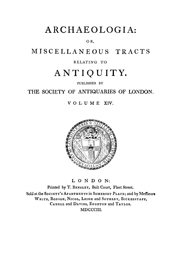 Archaeologia, or, Miscellaneous Tracts Relating to Antiquity, was published between 1770 and 1991. Articles from Archaeologia may be accessed via this site. Please click here for a full list of Archaeologia issues, or click on the All Issues tab above. The major publication of the Society of Antiquaries of London is now The Antiquaries Journal.